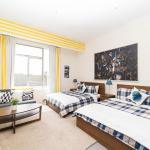 Amazing Walk Of Fame Apartment offers accommodation in Los Angeles a 2-minute walk from Hollywood Walk of Fame and a 2-minute walk from Dolby Theater. This apartment offers air-conditioned accommodation with free WiFi. The apartment has 1 separate bedroom and includes a kitchen with a dishwasher oven and dining area. A flat-screen TV is provided. The apartment offers an outdoor pool. Amazing Walk Of Fame Apartment provides BBQ facilities. Capitol Records Building is 1 km from the accommodation while Hollywood Bowl is 1.1 km from the property. The nearest airport is Hollywood Burbank Airport 11 km from the property.